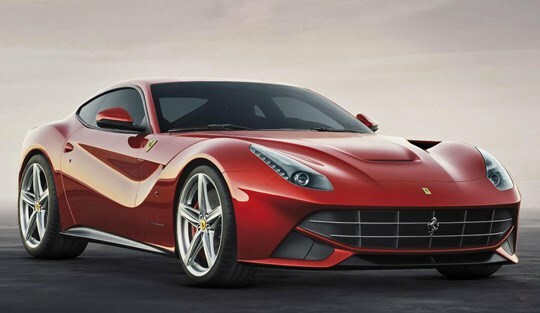 Ferrari has taken the wraps off its all-new F12 Berlinetta supercar. 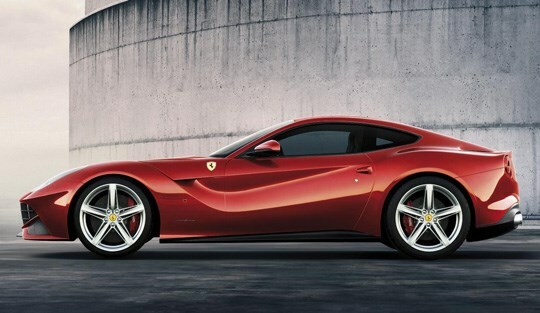 The Italian manufacturer states that the F12 is the most powerful road car that it has produced so far. Under the bonnet lies a naturally aspirated 6.3-litre V12 that outputs a monumental 730bhp and 690Nm of pulling power. This allows the Ferrari to accelerate from 0-62mph in just 3.1 seconds. Even more impressively it can sprint from 0-124mph in a mere 8.5 seconds. That's 0.6 seconds faster than the new McLaren MP4-12C. Thanks to extensive aerodynamic testing and development, which has helped minimise drag while improving downforce, the Ferrari's top speed is reported to be just over 210mph. Unlike the recently launched four-wheel-drive FF, the F12 features a more conventional rear-wheel drive layout. The V12 Ferrari is "mid-front engined" which means its engine is located in the nose but behind the front wheels. This aids weight distribution and handling. Power is transmitted to a seven-speed dual-clutch transaxle that combines the gearbox and differential into one unit mounted in the rear, improving the car's balance. With so much performance on offer, Ferrari has worked hard to ensure that the rest of the car is optimised to make the best use of it. The wheelbase has been shortened while the engine and interior has been lowered in the chassis to bring the centre of gravity closer to the ground. This has made the car more compact and agile. Due to the extensive use of lightweight alloys and an all-new chassis and bodyshell, the F12 tips the scales at a modest 1,525kg. 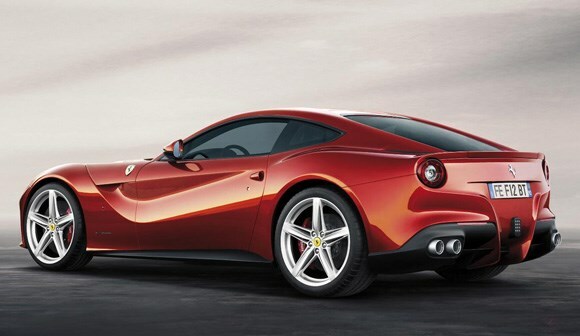 Ferrari claims that's 70kg less than the previous V12 599 GTB coupe. Even though it's lighter, the new materials and construction techniques used in building the F12 have reputedly resulted in a 20% increase in structural rigidity. That potentially further improves the Berlinetta's ride quality and handling capabilities compared to the 599 it supersedes. The F12's astounding speed is reined in by carbon-ceramic brakes, while magnetorheological suspension system keeps the supercar in contact with the ground. This uses special dampers, filled with a magnetic fluid, which can have their stiffness adjusted instantly by an electronically controlled electromagnet. Altering the current flowing through the electromagnet causes the fluid to become thicker or thinner, changing the way the suspension reacts to bumps. As with all newer Ferraris the F12 gets adjustable traction control, switchable stability control and an electronically controllable differential for maximising traction. The car even comes with Active Brake Cooling, a system that causes air ducts to open automatically to cool the brakes when they get hot. With the substantial V12 being capable of revving all the way to 8,700rpm, you may be surprised to find that the F12 is capable of averaging a claimed 18.8mpg. That's not bad, considering the performance on offer. Low emissions are not the Ferrari's forte, however, with CO2 emissions being rated at 350g/km. As a result you'll pay £460 a year for road tax and showroom tax of £1,000. Externally the coupe features styling that's the result of the collaboration between the Ferrari Styling Centre and Pininfarina. Although it might look like a big and imposing coupe the F12's actually smaller than a Ford Mondeo - so you shouldn't have too many problems parking it. Inside there are lashings of leather, carbon fibre and aluminium, and there's even a modicum of storage space. 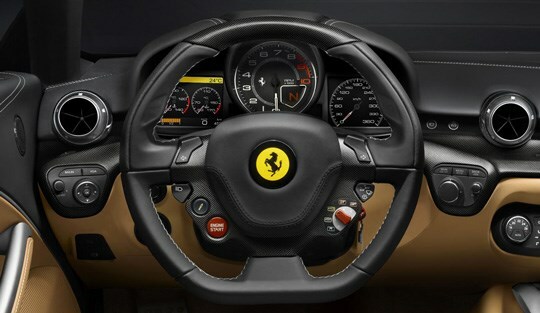 Ferrari claim that all of the important controls are in immediate reach of the driver and that the cockpit is designed to be as comfortable and as ergonomic as possible. No prices have been announced for the new Ferrari F12 Berlinetta yet but, with the 599 GTB Fiorano F1 starting at £212,067, buyers should expect to pay in the region of a cool £250,000. That's a hefty price tag but it does at least include seven years' worth of free servicing with no mileage limit. Sales are expected to start towards the end of 2012. The car will officially debut at the 2012 Geneva Motor Show, which Parkers will be covering live.